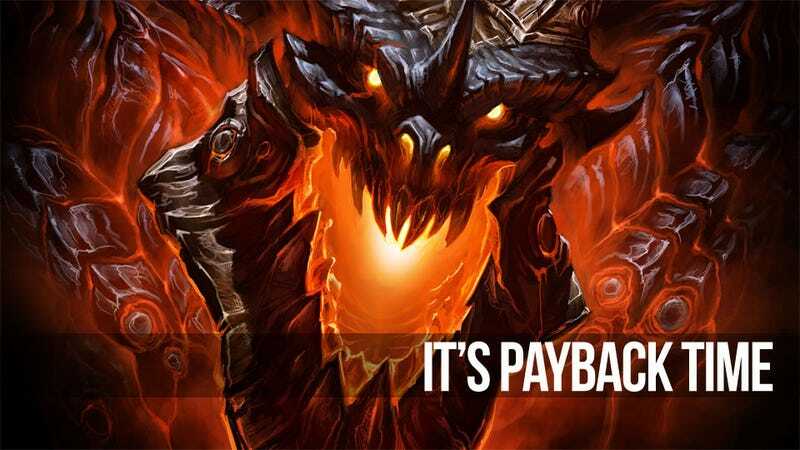 Soon hardened World of Warcraft players will have a chance to take on Deathwing in a Cataclysm-shaking end fight. The Deathwing battle will come in a soon-to-be released patch for the Cataclysm expansion which includes three new five-player dungeons, a new raid and some cool new Ethereal-powered abilities. The biggest tweak coming with patch 4.3 is the Ethereal ability to transmogrify a players armor. Starting with the patch, players will be able to choose the armor they think looks the best, as well as the armor that is most powerful to combine them into a single set. "We have a wealth of armor sets we created that people no longer use," said Tom Chilton, lead World of Warcraft game designer. Worse still, Chilton said, as players start to top out they being to look very similar because many players seem to stick to the high level, epic gear. The hope is that players will use "transmogrification" not just to mix and max their favorite armor, but that this new ability will encourage some players to go back through the game on the hunt for some of the armor they may have passed up because it was under-powered. To transmogrify a piece of armor it has to be the same type (cloth, leather, mail, plate) and stay within the class. Players just take it to an Ethereal who has set up shop in town; they transmogrify the two pieces into one. Chilton said Blizzard hadn't added the ability before now because it comes with a shifting philosophy about how the company views their game. It used to be that high level characters looked like high level characters, he said. It was a point of distinction, but as more and more players have topped out it's become sort of the opposite and too many players look the same. Another addition coming with the patch is "Void Storage", a new 100 to 150 items slots players can purchase with in-game currency. Like transmogrification, void storage comes from the Ethereals. Void storage is a pocket dimension created for a player that allows them to store extra items, but there is a downside. Finally, Chilton explained a new feature coming with the patch called "Raid Finder". The Raid Finder essentially operates like a dungeon finder, automating the search for fellow players on the hunt for a good raiding party. It will be built into the game's updated user interface when the patch hits, they said. The bulk of the patch, though, will be a lot new content, Chilton said. "It has a whole bunch of content," he said, "three dungeons for five player instances and a new raid instance culminating in the Deathwing fight." That Deathwing fight will be the most epic boss encounter to date, including a battle phase that takes place on the massive dragon's back as he flies through the sky. This will be the last patch that includes new raid content for the Cataclysm expansion, Chilton said. But there will be another expansion, he added. He's just not ready to talk about it yet.